Watch dolphins and whales from the terrace of this spectacular private ocean front villa. Sunset views of the Catalina Islands are breathtakingly beautiful. This beautifully landscaped villa features five bedrooms, four full bathrooms, and a spacious covered terrace. All bedrooms have remote controlled air-conditioning and three bed rooms have ocean views. The master suite has its own balcony with breathtaking view.Rental includes daily maid service.. Casa Bella Catalina is 3 km from the town of Flamingo with it's restaurants and shops. On the first floor you'll find an open floor plan, which includes two bedrooms, two bathrooms, kitchen, dining room and living room, all opening onto the terrace and pool. The spacious covered terrace lets you sit in the shade while enjoying the view, the sunset or a good read. Upstairs, you will find the Master bedroom suite with unforgettable of the Flamingo sunsets. The additional two bedrooms are located in a separate Casita on the property. And to make Casa Bella Catalinas comfortable and familiar as home, you'll find a full kitchen,washer/dryer, Cable television, air conditioning, CD stereo, and high speed internet. If you like to have the flexibility of snacking at home, we can stock upon your favorite foods. Many familiar American brands are readily available at the local grocery store. We traveled CR quite a bit on this trip and stayed in 4 different places. This one stole the hearts of all 10 traveling. Such a great place to stay, relax, and have fun. Thank you Craig. We are glad we were able to accommodate your group's Two night stay. Next time, you'll have to stay longer and enjoy more time with us. We had a fantastic time at Casa Bella Catalina. You were truly in your own private tropical paradise. The avocado tree in the front yard, lime tree and mango trees in the back were such a treat. We got to watch the iguanas eating all the mangoes before they ripened : ) The howler monkeys gave a chorus each morning and night. We kept hearing this banging on the roof each night, only to discover it was actually the monkeys! We would find little paw prints all over the chairs on the top deck. The house was beautiful. The pool was like bath water- our 4 year old loved it as it had a gradual decline and he could play all day. The beach as well was gorgeous. We also went to Playa Flamingo for the white sand/clearer water beach. The house is in an excellent spot as you are able to walk up and down the beach and there are several small restaurants you can eat at. The one thing that was a possible down side was the first night we got there- starting around 8pm to 2am, the bar next door had LOUD music and karaoke that kept us all awake. I was terrified this would be every night, but when we asked, it was apparently due to an anniversary party. We had no other problems, there is live music on Fridays, but it was no problem at all. Alex drove us from the airport to the villa- he was awesome. So nice, gave us a lot of pointers, stopped at the store for us. We then set up a river safari tour with him which was equally as nice. Edwin was also very pleasant, who drove us from the villa back to the airport. Miguel cooked for us 3 nights- this was delicious and such a treat. The fire pit is an extra bonus- my son loved collecting wood for the fire and then making smores!. It was so nice having the grocery store within walking distance- and I felt the prices weren't unreasonable at all. Absolutely loved this house and our vacation. We love Costa Rica- it is a beautiful country and has the friendliest people. What I think we will miss the most is the delicious fruit- you can't get mangoes or pineapples anywhere in the world like in CR. What can I say Morgan...your review is exceptional in every detail and will provide a great resource for future clients. I am so happy that you and your family enjoyed your stay and enjoyed the amenities of the villa and the area. Hopefully, your fond memories of our country and its delicious fruits will bring you back our way again ! We stayed at Case Bella Catalina the first week of April and were delighted with the house. It is spacious, has nice large bedrooms, and a great kitchen and living area for families. It is a beautiful home. The pool is fantastic as it offers both sunny and shaded areas and has a great ramp area to wallow . There were many beach loungers to go around for our party of six. The palapa located right at the beachfront was my favorite spot on hot sunny afternoons (everyday this time of year). It offered shade (from the mid-90's temps) and a great beach lounger or hammock for reading. The beach was also a good hangout and there was a floating dock about 300 yards off shore that we swam to daily. The house is located within a few blocks of several quality restaurants and nice little grocery store that sells liquor. The neighborhood felt very safe as does the entire country of Costa Rica, one of my favorite places on earth. Nonetheless, the house had a security system and safe as we travelled many long days on adventures. Tropical Homes staff (Roxanna and Rita) were extremely helpful in helping us find quality adventures (Selvetura Park @ Monteverde and Vandara at Rincon de le Vieja). Staff were also quick to respond to an issue we had with one of our doors and sent some one out the next day to fix it. The only negative comments I would make regarding the house were the kitchen supplies which were sparse. Would have been nice to have a few more hand towels, handiwipes, a floor mat, cooking oil, etc. Also, in group of six, no one was interested in staying in the back house (casita) since you had to go outside to use the bathroom. As such, we used only the three bedrooms in the house and since our party was six, it worked. The cleaning service and the pool keepers were also great. This home is located directly on the Beach and within walking distance to some great restaurants. There were 7 of us in our group. The house has a beautiful, rustic feel. The pool is very inviting and the grounds are beautifully landscaped. The top bedroom is the only one with a king bed and the bathroom has an open shower, so it gets pretty warm in the bathroom. The casita has 2 bedrooms with a layout of each room besides each other and located on the street. Luckily one of our friends took that room, but it has some issues. The window coverings are see thru, so it is not very private especially at night. Although it has a kitchen like area, there is no refrigerator or shelves/microwave (it would be really nice to have that) The bathroom is odd. You have to exit the inside of the home to use the bathroom that is located next to it. It is very warm, no windows & uncomfortable. Plus if you use this bathroom at night, the door locks on the casita as it is a self-lock deadbolt, so you lock yourself out if you forget. We used a rock to keep the door ajar to keep this from happening. Not a great set up. Comfortably, I would say no more that 6 people to use this villa. Regarding food, Good pizza; 2 for 1 on Tuesday nights next door. There is a hotel a few steps further at Bahia Del Sol has a good breakfast as well as 'The Shack" (a little farther away). Lots of restaurants to choose from within walking distance. You can also walk on the beach to some of the restaurants. The Beach House is another one located directly on the Beach. This is not a a huge tourist destination in my opinion, which is exactly what we liked (not like Tamarindo). We absolutely loved this area and the home overall. If you do cook in the villa, be aware that the oven only goes up to 390 degrees. We used it once. but ended up cooking on the cooktop to finish cooking some potatoes. The house was a great location. Between beach, pool, restaurants and other amenities, you couldn't beat the location. It would have been great to have more pool and beach amenities as I am used to that from other VRBO beach rentals. Kitchen staples would also be great. Despite all that we loved Playa Potrero, the beach was fantastic and you couldn't beat the sunsets! Nancy, our housekeeper was lovely and did a great job. What a spectacular home to celebrate my husband's 60th birthday with family and friends. This home was absolutely gorgeous....the grounds are your own private oasis. Not only were there beautiful flowers and plants, we also had mango, lime, lemon, avocados, coconut palms and banana plants. There was a family of iguanas that visited with us regularly, as well as the monkeys that hung out across the way. As for the view, what can I say, it was magnificent. Whether you were sitting under the covered patio or relaxing on the hammock or lounge chairs, the ocean was breathtaking and just steps away. At night we sat around the fire pit and enjoyed the sounds of the surf. Nancy our housekeeper was wonderful. She was there 3 times during the week and kept the home in perfect order. The gentleman who took care of the pool (i'm sorry but his name escapes me) was there every morning to take care of the pool and the grounds. The managing agent, Jesus, from Tropical homes was very attentive. He was there to greet us and was quick to respond when we had a few minor issues at the house. The location was ideal. We had at least 6 restaurants which were in walking distance from the house, as well as a small market. My suggestion would be to stop at the larger supermarket before coming to the house and stock up, as the small market was somewhat pricey. If you are looking for adventures, I would highly suggest using Flamingo Adventures, just down passed the market. Franco was extremely accommodating and Andres our guide was unbelievable. 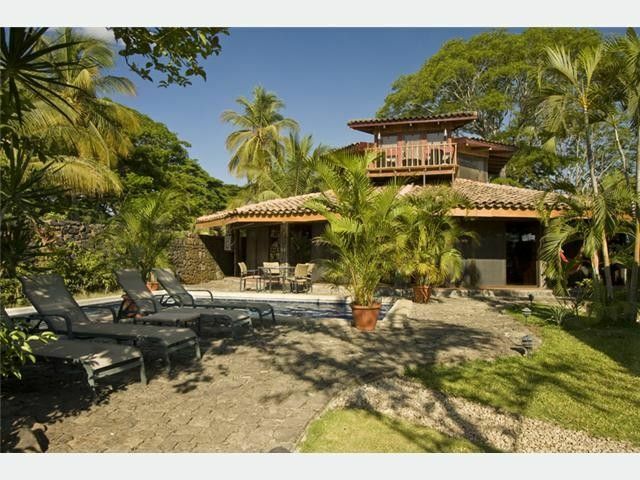 Their rates were great and we were able to have them take our group of 9 to Tamarindo and Flamingo beach for dinners at very reasonable prices. When we return, we certainly will contact them for our travels while in Costa Rica. Looking forward to return to Costa Rica sometime soon.